Tamron's proprietary VC (Vibration Compensation) and USD (Ultrasonic Silent Drive). Achieves leading-edge image quality while boasting the most compact design in its class. One special XLD (Extra Low Dispersion) glass in concert with four LD (Low Dispersion) elements minimize chromatic aberrations. This combined with a new optical design that delivers high contrast and high resolution throughout the zoom range achieves leading-edge image quality.Tamron's advanced multi-layer coating technology dramatically improves lens performance by reducing flare and ghosting for crisper, clearer images. The rounded diaphragm affords the photographer spectacular blur effects, delivering the kind of rich expression only achievable with a high-speed telephoto zoom lens. The most compact full-size, high-speed telephoto zoom lens with VC (Vibration Compensation) image stabilization and USD (Ultrasonic Silent Drive) in its class delivers superior mobility, enabling photographers to capture the previously unattainable. Features USD (Ultrasonic Silent Drive) to power a speedy AF drive together with a continuous manual focus mechanism. The VC (Vibration Compensation) image stabilization mechanism reduces camera shake to deliver sharp images. VC (Vibration Compensation) - VC (Vibration Compensation) is Tamron's proprietary image stabilization system. Tamron's VC is a three-coil system, whereby three driving coils activate the shake-compensating VC lens group electromagnetically via three ceramic balls. The VC lens elements are held in place only by contact with the ceramic balls, achieving smooth movement with little friction. This provides a stable viewfinder image with excellent tracking performance. And as the VC lens may be moved in parallel using only the motorized control, the mechanical structure has been simplified, enabling the creation of a more compact lens. New VC System (moving coil method) - Tamron's original VC image stabilization mechanism utilized a moving magnet system whereby a heavy magnet was positioned near the moving VC lens element. In the new VC unit, the positions of the magnet and the coil are reversed, and because of this the VC optical lens element is attached to the coil. The new VC mechanism employs a moving coil mechanism with a lightweight coil, and the lighter coil reduces the load on the drive system. Thus, the lighter, more compact new VC unit contributes to the lens's overall light weight and compact size. The Ultrasonic Motor - In the ultrasonic motor, a piezoelectric element arranged in a ring formation generates ultrasonic vibrations in a metallic ring stator, and the vibration energy is used to rotate a metallic ring rotor that is attached to the stator. The rotation energy is in turn transferred from the metallic ring rotor to operate the focus lens. Excellent Companion to Tamron's Fast Standard Zoom - Tamron's SP 24-70mm F/2.8 Di VC USD (Model A007) is a high-speed standard zoom lens that is also equipped with four features: superior image quality, USD (Ultrasonic Silent Drive), advanced VC (Vibration Compensation), and is designed for full-size SLR cameras. By combining these two lenses, the focal length will be extended from wide 24mm to telephoto 200mm. 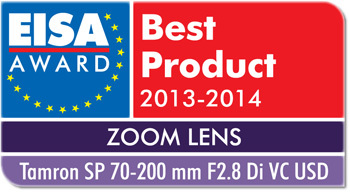 This lens was the recipient of the 2012-2013 European Sounds and Imaging Association Best Product Award: Lens.